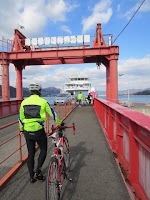 Today's ride took the Saturday group from Fukuyama > Onomichi where we met up with marathon maniac Ynaks! Still hungover from yesterdays night out, but off we went! You gotta enjoy the view sometimes! lunch time! ramen + gyoza set! From there we headed to Innoshima and rode the less traveled hilly route. With deep rims the flats were no problem! Especially from 35kmph and above! I tested the wheels and my legs on the hilly coast of Ikuchijima. Attack! Things went well until I was caught by Pei on the last climb... I'm tired. I can't breathe. I'm going to puke.. Trauma(虎馬)! 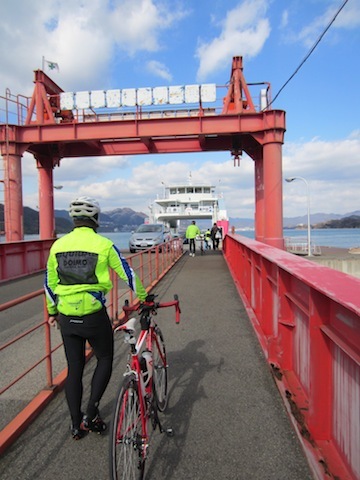 After recovering we descended and headed to Setoda Port on Ikuchijima. The four of us pulled on the front keeping good pace. Just as we arrive, we see the ferry pulling out.. terrible timing! After waiting for the next ferry we arrived in Mihara for a much needed lunch break! Energized. Next, we checked out the Mihara Daruma Festival. Lots of people, festive environment, the smell of food stands! I want a beer! Before it gets too late we head back to Fukuyama for a distance of 100km. Maybe deep rims aren't for me? They work well at high speeds and seem to be fast on climbs, too but somethings not right... Maybe we'll get along at tomorrow's practice?? We'll find out!